Welcome to your cabin where we have 30+ waterfalls within 30 miles! Nestled in the middle of the Pisgah National Forest, here you will find the privacy you seek and a place you can unwind, unplug, relax and recharge. With 13+ miles of hiking trails outside your front door, you can explore all day and hike back to your own private hot tub, grill out and enjoy time with your loved ones. Immerse yourself in nature, your body and mind will thank you later! Hike from your deck to waterfalls ... Check! 12 miles of hiking trails within walking distance ... Check! Log Cabin w/ 30' ceilings & mountain views ... Check! WiFi & 190 Satellite Channels ... Check! Grill & Deck ... Check! Your own personal waterfall guide (me!) ... Check! Location, Location, Location ... Check! Vacation inside a National Forest ... Check! Instagram worthy photo opps ... Check! Access to the neighboring community's game room with pool table/ping pong, arcade games, fire pits & a fishing/swimming pond ... Check! We think we will check all of your boxes you can think of and some you may not have thought about yet! When choosing a cabin to buy, we wanted something in the middle of everything, yet secluded and private, the location of this cabin could not be better! Only a mile to the Parkway and in between Boone and Asheville for amazing day trips - there is no area more central than Spruce Pine! And we are only 15 minutes to Linville Gorge, the Grand Canyon of the East with 13,000 unspoiled acres, hiking trails, waterfalls, rock climbing, etc. If you love the roar of a good waterfall or the hike leading you to new territory, having visited 300 waterfalls myself, I can guide you to the well-known and the hard-to-find spots - its my job to make sure you return! Find me on Facebook where I have 23,000 fans who love seeing and planning their next adventure! 1 mile off the Blue Ridge Parkway. Everything is included just bring the one you love. We are surrounded by over 30 waterfalls in the heart of the Pisgah National Forest. Walk to one from our porch and many more close by. Restaurants and wineries and shopping, just 15 minutes away although when you're on our porch you feel like you are in the middle of nowhere. We vacation here ourselves so we keep it up to date with all the comforts of home. We know you'll love it! Please book away! Our calendars are accurate and we have been inviting families and returning families to the cabin for many years! Pets Approved with a $70 fee and a large crate is provided. I fell in love with the Blue Ridge Parkway in 2011 and had to own my own place! I picked this location due to it being central to everything. I am a hiker, adventurer and I have hiked all over Western North Carolina. Friend me on Facebook and see my unbelievable pictures of our beautiful mountains alongside my 23,000 fans! I have been to over 300 waterfalls and can direct you to all the best places. Location, location, location! Right off the Blue Ridge Parkway central to Boone, Blowing Rock and Asheville. We are minutes from a full week of activities! There's no place like it on the Blue Ridge Parkway! Secluded yet close to everything! Everyone who has been here has loved it. We have had 100's of repeat guests since 2012. Towels included just bring your toiletries. 30' Cathedral ceilings, cozy fireplace, Dish TV with 200 channels. Fully stocked kitchen to prepare any meal you'd like, coffee maker, coffee and filters. Seats 5 we also have a picnic table outside. Books all about the area on the coffee table. Walk to a game room 1/2 mile from us during peak season, closed in winter months. Ping pong, air hockey and arcade games, perfect for a rainy day ! 26 miles from us, Beech and Sugar Mountain in the Banner Elk area. There is golf all over the High Country! Hot tub under the stars! Lights up blue at night! On your private deck! You'll love our cozy cabin in the heart of the Pisgah National Forest. Centrally located between Boone and Asheville for quick day trips! I loved this cozy cabin! Place was so cute and very comfortable. I enjoyed the community around the cabin everyone was very nice and the view from the cabin was spectacular. It was also pretty cool being between Boone and Asheville so we never ran out of things to do. They also had a ton of board games which I found pretty cool. Also the kitchen was fully stocked with everything you would need and the place was super clean. Sheets and towels were provided. Jill was very nice and gave us a lot of ideas for things to do. Her directions were very specific and clear so if you plan on traveling to her place make sure you have them and read them carefully or else you might be driving around forever. After my stay I was asked personally by Jill how it was and she even asked what we did which was nice. We are now facebook friends and I will most certainly be returning. Thanks so much for taking the time to share your experience with others who might want to visit the area! We are looking forward to seeing you in the fall! Jill’s cabin was everything we needed to experience winter hiking in NC mountains. After days of hiking and exploring the area we enjoyed incredible evening views from her deck hot tub. We are avid outdoor adventurers and Jill personally gave us days worth of ideas to explore. From waterfalls to tasty area restaurants. Her cabin was spotless with everything we needed to cook great breakfasts and dinners to fuel and recover from our active days. Her mountain style and gas fireplace made a warm retreat during some of the coldest days of winter 2019. Thanks so much for sharing your experience with others! I'm so glad you loved the area and cabin as much as I do! I will also let my housekeeper know your kind words about it being spotless. Thank you!! Loved it. Everything I was looking for! My wife and I spent a great 3-night getaway in a cozy cabin just off the parkway in North Carolina. Ms. Jill was very informative about everything to do in the immediate area surrounding the cabin. You just won't get that sort of information without looking it up yourself. The Cabin was very comfortable and has all of the amenities. Price was very reasonable too. We spent our days wandering up and down the Parkway seeing the sights, visiting Parkway Historic landmarks and hiking to two of the Linville Falls viewing points. 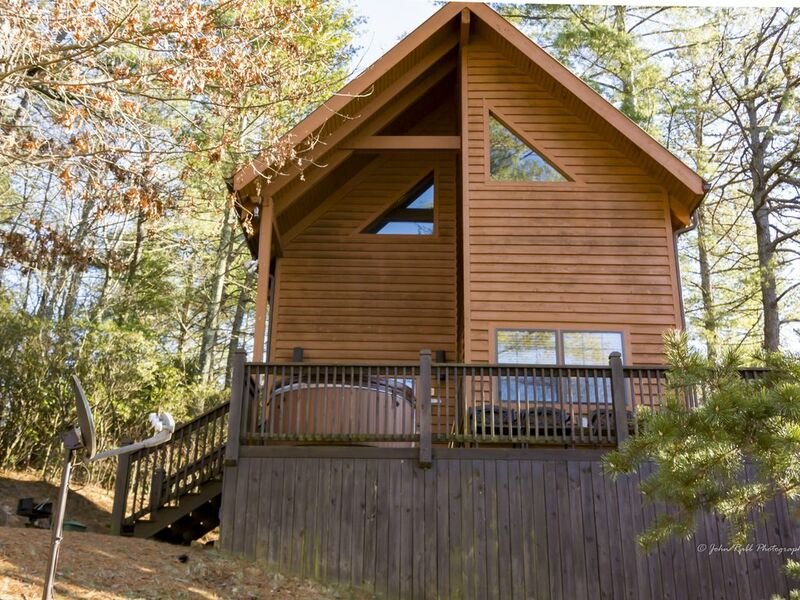 Granted this was not in the Fall, but if you love the clean fresh air and with all of the comforts of home, you will love staying in one of Ms. Jill's two cabins. Early morning coffee on the deck is my favorite. I give it a 5 Star Rating. Thanks so much for staying!! I appreciate the review! Be sure to check our new lower rates and refer friends to us to get $50 per referral! This was our first trip out of state and neither one of us have ever been to North Carolina before and we were a little nervous booking online. Jill has thought of everything! She has books on the coffee table about sites and things to do near by. Everything that we needed was in the cabin! Walmart was about 5-10 min away where we could get everything that we needed. The campground that you drive through is very accommodating and allows you to use their property and amenities. We fished off the dock every night.My favorite part of our stay was the nights. We would open the windows, light candles, put music on and relax in the hot tub while watching the fireflies and smelling our food cooking on the grill. We walked the trails and went to the cavern and to two waterfalls. We had an absolute perfect vacation and cannot wait to return with the kiddos! Thank you Jill! You do a great job with your rentals! 5 stars!